“John Loves Mary” is a movie made in 1949, starring Ronald Reagan, Jack Carson and the husky-voiced Patricia Neal. The script was adapted from a Broadway play by the same name, originally written by Norman Krasna. I found the story charming, and wondered why I liked it so much, till I discovered that Norman Krasna also wrote the story for another movie I like, called “The Ambassador’s Daughter“. 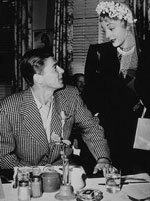 The story goes like this: John Lawrence (played by Ronald Reagan), a GI returning from WWII, meets his love, Mary McKinley (played by Patricia Neal), who’s waited faithfully for him all those years. But he’s got a secret. While in England, he found and married the old flame of his army pal, Fred Taylor (played by Jack Carson), in order to bring her to the States and reunite her with him. You see, his pal saved his life during the war, and he wanted to return the favor. Well, as soon as he returns, Mary wants to marry him. He’d love to, but can’t, since he’s already tied the knot, and needs to spend several weeks in Nevada getting a divorce. He tries to tell her, but can’t. Her father (played by Edward Arnold, who always seemed to get these sorts of roles) throws the weight of his senatorial position behind the wedding, and speeds all of the proceedings up at city hall. Hilarity ensues as both John and Fred scheme and connive to delay John’s wedding to Mary. All ends well, of course, but it sure is fun to watch what happens in the meantime!